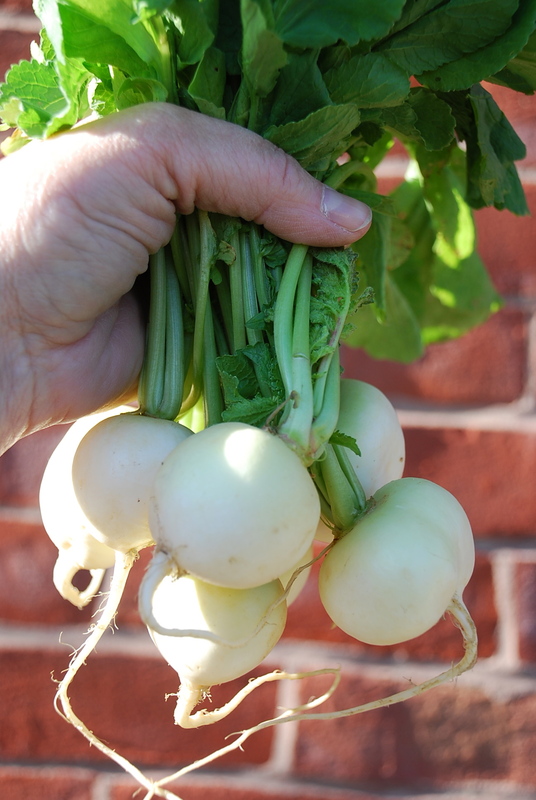 Lots of gorgeous green things in my half-share today – spinach, kale, lettuce, bok choy and more – but what caught my eye immediately was this bunch of White Beauty radishes. Perfect for braising. 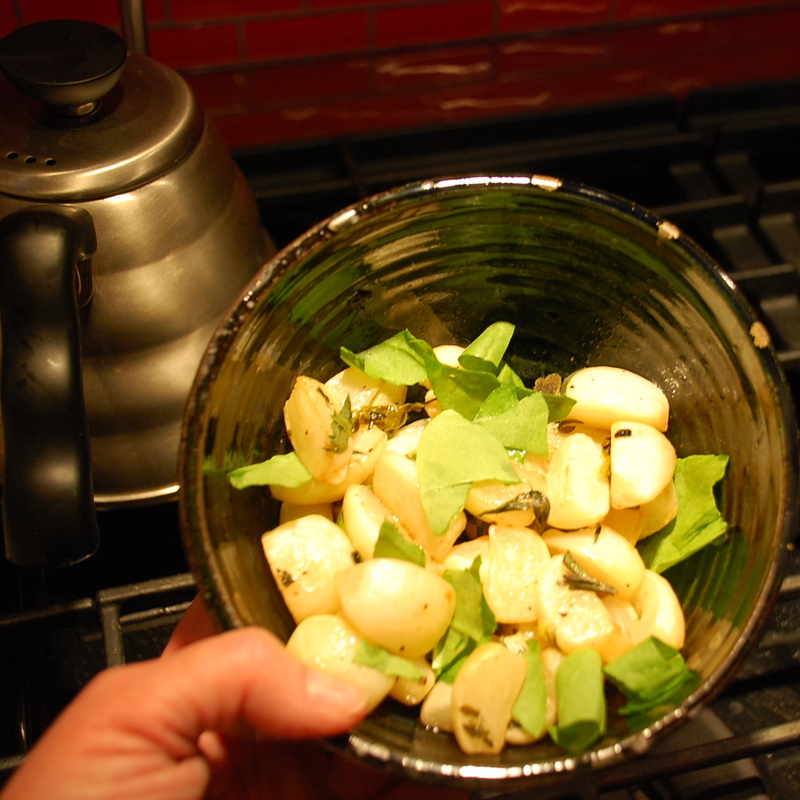 I’d never had white radishes before last spring – and I’d never even cooked radishes before last spring, either. If you’ve never tried it, you ought to. For the radish wary (I know some folks find them too peppery to eat raw) braising tempers a lot of the root’s fire. And for the radish weary (even I eventually get tired of rad-and-butter sandwiches), braising is a terrific change of pace. The method is straight out of How to Cook Everything, which I adore because Bittman gives you the basics and practically insists that you experiment from there. I’ve since tried this technique using different roots (radishes, turnips, parsnips, and carrots) . . . different braising liquids (chicken stock, vegetable stock, white wine, or a combo of stock and wine) . . . and different herb accents (subbing tarragon for the thyme or garnishing with dill, sorrel, or parsley). Tonight, I had a half bottle of halbtrocken Riesling and a slice of leftover ham steak in the the fridge, so I went with the wine version, spiked with a few torn sorrel leaves at the end. The braise: Melt the butter in a saucepan. Add the oil, shallots, radishes, and thyme, and toss to coat. Season with salt and pepper; add enough wine to cover about halfway up the radishes. Bring everything to a boil, then reduce the heat. Simmer, covered, for about 15 minutes, just until the radishes are tender. The glaze: Raise the heat back up to a boil to reduce the liquid. Don’t get distracted at the end – it’s easy to wind up with a charred, goopy mess pretty quickly. What you’re going for is a slightly sticky, slightly creamy glaze – a gel, almost – from the pan juices. When the radishes are glossy, you’re done. Taste. Adjust the seasoning. I usually like a squeeze of lemon at the end, but both the wine and the sorrel I used have bright, citrusy tones already, so I skipped that this go ’round. Easy. Quick. Delicious. About 25 minutes start-to-finish, and most of that is time you can be doing other stuff. Like eating the rest of the radishes raw. On crusty bread. With butter. I keep trying those braised radishes but I haven’t quite got it right. I’ll try your method and let you know. I think the key is the braising liquid, Tammy. Carrots and parsnips are pretty forgiving. But I’ve noticed that with radishes, my best success has been when I’ve used a wine that’s not quite fully dry. I bet those few grams of residual sugar help soften some of that bitter edge radishes sometimes have. You’ve inspired me to try using stock with a splash of either balsamic or maybe even maple syrup next time. Thanks.